The Holidays are upon us and that means Nintendo has wrapped up another year of 3DS and Wii U games including the epic Xenoblade Chronicles X. 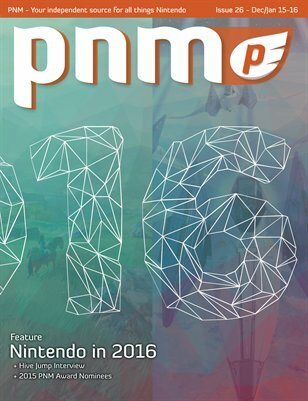 In this issue we recap the best games we played in 2015 while also looking ahead to 2016. It’s going to be an interesting year as we should hear the first concrete details of Project NX, Nintendo’s mobile games, Star Fox Zero, and the new Zelda game for the Wii U. We also had a chance to speak to the good folks at Graphite Labs about their intense new multiplayer title, Hive Jump. And be sure to also check out the latest reviews in this issue including Xenoblade Chronicles X, Tri Force Heroes, Mario Tennis Ultra Smash, FAST Racing Neo and many more! Happy Gaming!